I’ve finally finished editing the photos and putting an account together. I’ve written by day, leading up to summit day on the 21st May. It is a long and detailed account but it’s for myself as much as anyone – the photos in the separate post are in chronological order and dated so you can follow the sequence. I hope you enjoy it! Russell had announced the teams and summit dates at the meeting on the 14th, and the following days were spent preparing – both practically and mentally – for the departure of Team 1 early on the morning of the 17th. I decided not to pack until the day before and just to try and relax until we were finally about to leave. On the morning of the 16th I began to get ready at last, and suddenly realised how much I had to do. Sort through all my barrels, write a post, test my oxygen mask and regulator, get Alix issued with a radio, and so on. The list was long, and eventually Alix wrote it all out and stood over me, clipboard-style, until everything was checked off. I was so lost in thought about the summit attempt that it helped a great deal to have someone else make sure I had everything in place. Once I left camp, there would be no way to replace anything. A missing spare lithium battery for my camera, or worse my head-torch, could end my summit attempt high on the mountain. I felt slightly nervous for the first time and, as I later wrote in my last post that evening, I had a strong desire just to get on with it. 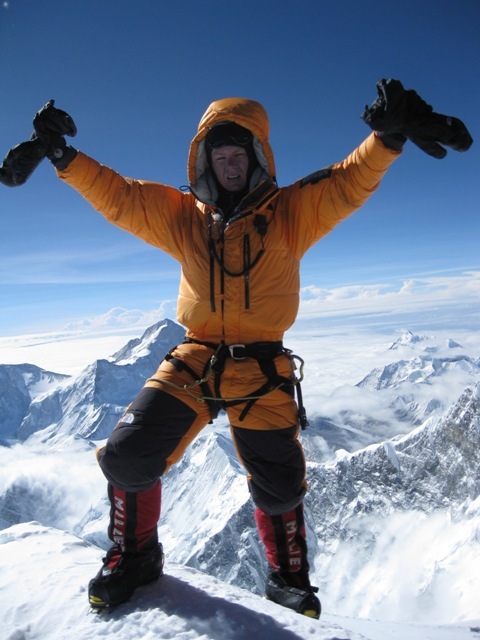 I had my last interview with The Discovery Channel and was told that a Sherpa would be following me (one of four following climbers) on summit day equipped with a ‘helmet cam’, which meant that my every move, and potential failure, would be captured on film as long as he was looking in my direction. The good side of course is the chance to have unique footage for my own memories. By dinner I was packed and after a quiet supper I went to bed. I found it very hard to drift off to sleep as the departure loomed. The alarm went off at 1:45am, just before one of the Sherpas, for once whispering, said ‘hot towel’ and ‘bed tea’ through the tent door. I had hardly slept at all, but had drifted off just before so the wake-up came as a jolt. I flicked on the headlamp dangling from the roof of my tent and began to pull the remaining layers on, before I attacked the task of getting my huge Millet double boots on. By 2:05am I was out of the tent and on my way down to breakfast. After what seemed like a couple of minutes, suddenly everyone seemed to be outside, and I could hear the familiar jangling of metal as climbers checked their harnesses and carabiners clicked. I stepped out of the mess tent into the night, pulled on my pack, and began to fiddle with the radio microphone that would attach to my shoulder strap. From that moment I completely blocked everything out, other than the task ahead. I didn’t even look up at Everest or the Icefall, or I may have noticed that it was highlighted by a clear night and a bright crescent moon. Or at least this is what Alix later told me – I didn’t notice anything. I vaguely remember motioning to her to film the departure, then suddenly we were striding out of camp. Apparently I had stared straight at the upheld camera, my gaze transfixed but blank, but I don’t remember any of it. I didn’t even say goodbye to her– not on purpose, it just didn’t occur to me. 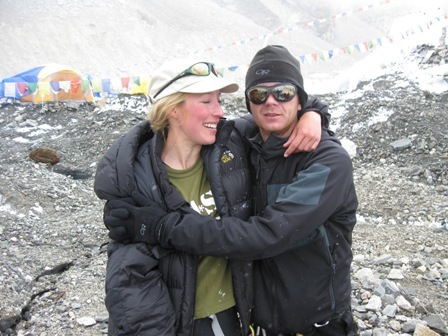 Alix later told Russell this and he was most approving – Sherpas never say goodbye, not even on the telephone, as they believe it brings bad luck. It was 2.30am. We marched in single file slowly through the moraine, each lost in our own thoughts until we reached crampon point at the main Base Camp. We were the first – there would be no queues in the Icefall for us, once again. By 3am we were off – the terrain was at first familiar, then new. The route through the ever-shifting glacier had changed in the two weeks since we had last climbed through, with all new ladders and a much more direct upwards route through the ice blocks. The avalanche had buried much of the route I was familiar with. 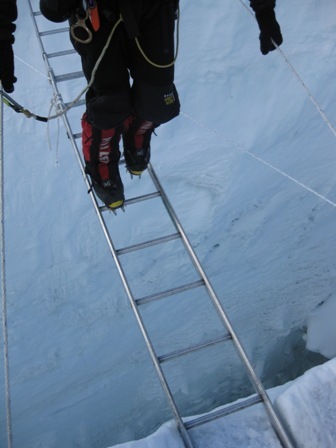 We moved swiftly upwards and emerged from the Icefall at 6.30am – we had moved quickly. We bypassed Camp 1 and climbed straight into the Western Cwm. I was at the front with Moises Nava Falcon, John Black and Chris Dovell. We moved at a steady pace, enjoying the cool of the early morning in the Cwm. We did not stop, but kept up a steady rhythm until we reached the route into Camp 2, still well over an hour away up the moraine. Then the sun rose from above Everest and we began to cook, and slow down. Eventually we arrived at Camp 2 by 9.30am, before the worst of the heat. The rest of the team was not so lucky, getting caught in the Cwm in the searing heat as they entered it in the sunshine. It further slowed their progress, and the last arrived at 1pm, very exhausted by the experience. We all spent the rest of the day resting and in the case of those who got in later, recovering from severe dehydration. We rested the next day. I woke late, having once again missed breakfast due to the absence of bed tea. For some reason my sleep was much deeper up here at Camp 2, as it was last time. I spent the day preparing, pulling out the kit bag I had stashed two weeks before, and packing and re-packing my rucksack until it had nothing more than I needed. I would need to take food for three days, although it was likely that I wouldn’t eat much, plus all the equipment for my climb. 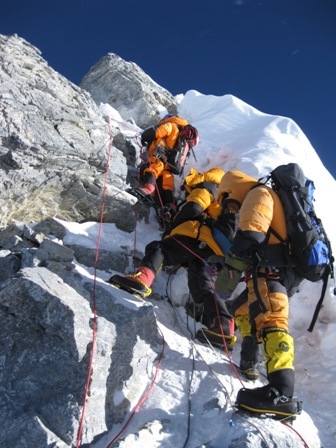 The Sherpas don’t carry any personal gear, so everything had to be carefully chosen as it would need to be carried up to at least 8,000 meters. I still over-packed, as I would later discover on the South Col. Lunch passed and I realised I could not eat another plate of the same food, so I quietly slipped into the Sherpa kitchen to make a bowl of the same food I would end up eating for the next four days – tortellini with cream – my same ‘lucky food’ that I had managed to eat the night before the Cho Oyu summit attempt in 2004, when I wolfed down a bowl of this rich carbohydrate and protein at 7,500 meters, to the astonishment of my fellow climbers. It had stood me in good stead, as it would now. 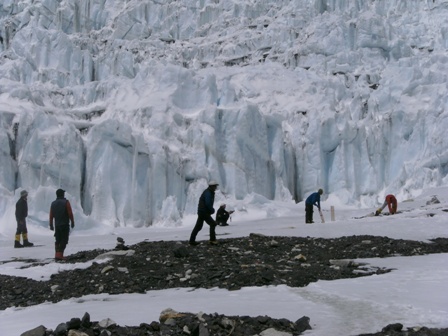 After lunch Phurba extracted three stumps, a bat, along with a tennis ball – Russell had asked that we play the promised match at Camp 2 – the one we challenged the Everest Test to all those weeks ago. 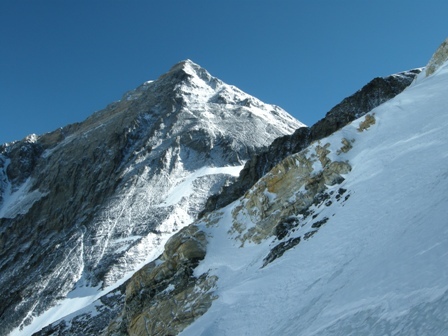 So we formed two teams and played on the flat snow immediately below the South West Face of Everest. Not that I know much about cricket, but it can hardly have been the most elegant game at that altitude. Phurba again showed his astonishing sporting ability by proving excellent at the game! It was a surreal sight though. This was the last night we would dine together or be served meals – from now on we would cook for ourselves in our tents. Everyone was lost in thought and back in their tents by 6.30pm to prepare for the morning. We rose at 4am and left for Camp 3 at 5am. I felt good and moved into the front of the group behind Moises. Together we negotiated the route to Camp 3 quickly and without stopping, arriving shortly after 9am, where we helped sort out camp. The rest of the day was uneventful as we rested, ate what we could, and hydrated. I felt much better than my first visit to Camp 3, and called Alix on the Sat phone. I was at 7,400 meters without oxygen and felt very strong. It was a good feeling and I went to bed happy and feeling optimistic. I went to bed at sunset – around 7.30pm. Unable to sleep, soon after dark I heard a commotion – someone was walking through camp shouting for help. It turned out to be a Russian climber from another expedition, returning from his summit attempt that day and descending in the dark. He was disorientated and exhausted and eventually guide Adrian took him in and gave him fluids and some oxygen in one of the spare tents, while Russell attempted to locate his expedition leader. Once again as soon as trouble hit, Russell’s expedition was the first port of call for help. The Russian climber would eventually leave a very grateful man in the morning and continue his descent. Eventually I drifted off to sleep. 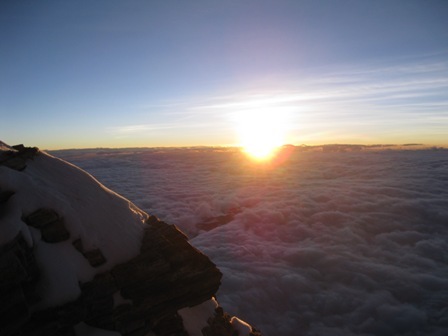 The next morning the plan was to leave at daybreak and be on the South Col by early afternoon. For the first time during the expedition, we would be climbing with oxygen, albeit at an initial low flow rate. We ended up leaving at 6.30am and were soon on the steep, icy slopes above Camp 3, higher up the Lhotse Face. This was all new territory, and it felt hard. I didn’t feel a spring in my step at all, or even particularly fast. There were two long snow traverses across the sheer face – one to the base of the Yellow Band and another between that and the Geneva Spur. By the end of the first my heels of all things ached badly, an ache that got worse with every step – the traverses were steeply sloping, making the footwork awkward and uneven. After scrambling over the crumbling rock of the Yellow Band, I began the second long traverse – sweeping, steep and up to the left. Again my heels ached, and my legs felt heavy. The mask was slipping over my face and would not stay in one place – I would later understand why, but right then all I could do is continuously push it back over my face. I realise now that I was getting very little oxygen given most of it was likely escaping. Whatever the reason I found the going consistently hard, and at one point three western climbers from another expedition passed me – something that hadn’t ever happened on the expedition up to that point. I didn’t feel good. The long, twisting climb up the Geneva Spur seemed to go on forever – very steep at the top, tiring, real climbing with my feet often placed above my hands as I inched my way upwards. I was almost at 8,000 meters now and felt it. Finally I reached the top of the Spur and clambered over into the snow. I was very tired. The tents at the Col were still an half hour traverse away. Still more. Within a few yards of the top my ankle rolled, even in my large over-boots. I heard a crack. I was panicked that this could be it – at first I had to sit down on a rock and just hold it, but eventually the pain subsided and I was able to put weight on it. As one of the guides said at the start of the trek in after seeing a particularly gruesome ankle roll, mine were so bad and so loose that I actually avoided getting a serious injury. Perverse as it may sound, this was the case again. Eventually I walked, slightly hobbling, into camp. As usual, our tents were the furthest away, and the closest to the route. Finally I arrived at my tent and got in. It was 11.45am and I was on the South Col – it had taken me 5.15 hours, and I was only the fifth of the team to arrive. This didn’t feel good. So here I was on the famous South Col at 7,960 meters, one of the most inhospitable places on earth. 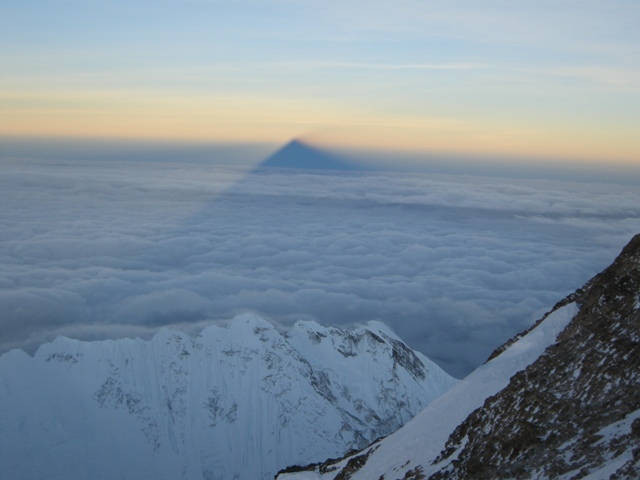 The Col is the highest of its type in the world – essentially a flat space about the size of four football fields, with Everest rising on one side and Lhotse on the other. The high winds at this altitude are forced through the narrow passage of the Col as they hit the surrounding mountains, making them stronger. You can rarely hear people speak on the Col, unless they are standing next to you. This was the where the storm hit violently in 1996, and all the climbers ‘huddled’ to try and survive. This is where Beck Weathers was left for dead, and where Yasuko Namba lay forever, just yards from the tents. But when I arrived it was sunny and still – not frightening at all. I got into my tent and started the almost automaton-like task of melting snow. We would not be carrying much water on summit day – in my case two half litres of water, one in a small bottle, the other in a Thermos – so we had to hydrate our bodies as best we could now and for the rest of the afternoon – and boiling a litre of water could take two hours up here. Anything we could eat would be a bonus. Most didn’t. I even had my tortellini again – edible if not very tempting at close to 8,000 meters! The afternoon passed quickly and before dark there was a magnificent sunset, lighting up Cho Oyu 20km away – I was now almost as high as its summit. I thought about the night I had climbed it four years ago and hoped I would have the same luck with the weather as I did then. But the day had been hard, I hadn’t been the strongest by a long shot and it worried me. Had I peaked too early? After all, we had what was usually an 18 hour day in front of us, and we had only climbed for 4, 5, 6 hours each day. This would be different. I didn’t feel strong, and talked to Alix about this during our last Sat phone call – it was the first time she had heard me feeling less than completely confident. Compared to many others, we were a fast team, so we decided to leave much later than normal. Recently teams have been leaving earlier and earlier – each trying to steal a march on the next team. 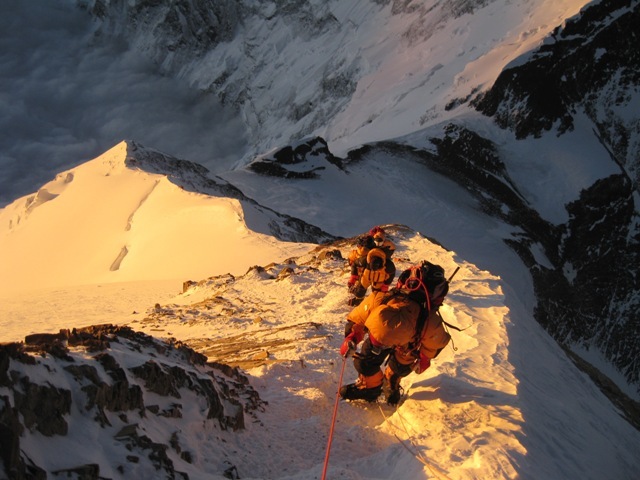 Teams regularly left as early as 8pm in the evening, but as Russell had warned me, if you are strong on summit day and leave that early, you could end up reaching the summit in the pitch black – what a pointless exercise. You get to the roof of the world and all you can see is the light from your head-torch. You can’t wait around for sunrise because it is so cold standing still. It had happened to the Astronaut on the IMG team the night before – leaving at 8pm they climbed strongly and reached the summit before dawn at 4am. We decided to leave at 11.30pm instead and let slower climbers leave early. The plan was to catch up with them by the Balcony at 8,450 meters and pass them on the flatter terrain after that. We would wake up two hours before departure – it takes that long to get ready at this altitude as all your cognitive functions are running very slowly. At 7.30pm I laid down, fully dressed, save for my outer boots (I even had my harness on), and fell into a deep sleep. 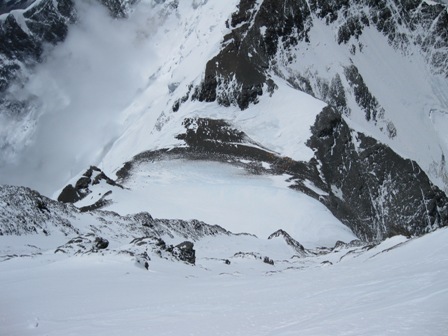 Within 15 minutes of leaving camp we began rising up the other side of the South Col, up the triangular face. As the angle steepened and the pace of the climbers in front of me slowed I suddenly realised how good I felt. Gone was the lethargy and pains of the day before. I felt good, strangely rested, my legs strong. By now we were all on the ropes and I kept in behind those in front despite feeling I could go faster. Shaun, one of our guides, turned round to me and asked ‘Who is that? – I replied it was me – he said, ‘you should pass this guy’, indicating towards the man in front of him. I unclipped from the rope and, much as you do on a country road, moved out. 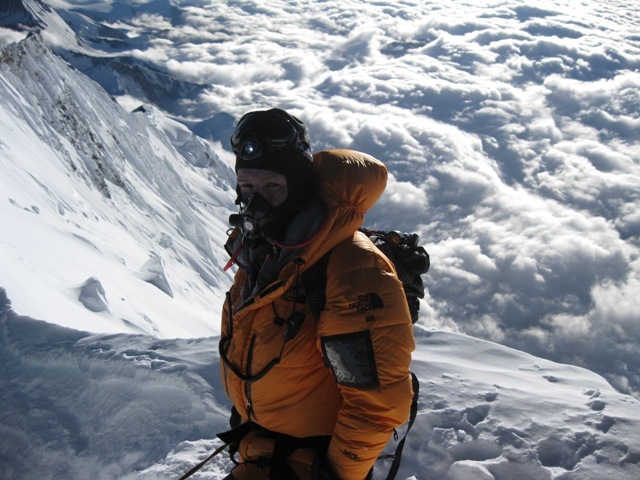 In front of the man were about twenty other climbers and Sherpas in close formation. I realised that this would be my only chance to pass until after the Balcony and I began to run in the snow past them. I passed them all and clipped back into line. 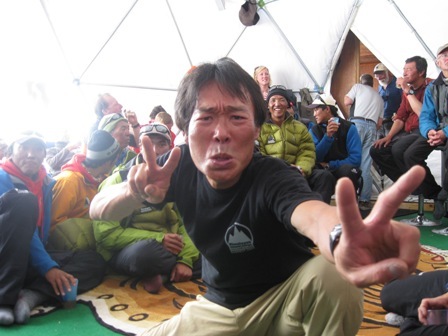 The Sherpa filming me was taken by surprise by this sudden burst of energy and took a while to arrive. I felt fine – a bit out of breath but fine. It was then that it hit me that as long as the weather held, I was going to do it. I continued up the ever steepening slope and within another 15 minutes I came up behind three climbers. Soon I realised that they were Moises and John, good friends and two of the strongest climbers on the team, with a Sherpa. Now that I was with climbers I knew were of a similar pace, I settled in behind them. In any case, it was so steep you couldn’t pass even if you had wanted to. Soon after we hit the rock band, a steep section of rock that was unusually exposed this season. At this point I realised that much of the climb would indeed be unlike other years. For almost two months now Russell had said that the lack of snow – the mountain was unusually dry this year – would make the ridge harder. Now I was experiencing this first hand. Usually this would have been a steep snow gully, but I found myself repeatedly with my feet at waist height, balanced on precariously small ledges. It would be harder up towards the South Summit for the same reason. Each of these scrambles – easy at sea level – left me gasping for breath. As I looked up all I could see was a black sky and the two people in front of me. On and on it went, until I could just about recognise a ridge line ahead. This could only mean one thing – we were approaching the Balcony. Soon we were there – about six of us, including Adrian the guide in the lead, shouting at each other through our oxygen masks, as we had come into wind as we had crested the ridge. It was 2.30am and we were at 8,450 meters. The Balcony is the first of the well-known points on summit day. About the size of a small swimming pool, it is the only truly flat area on the route and a traditional place to stop. It was here that Hillary and Tenzing pitched their tents the night before their summit attempt. It was here that Beck Weathers waited for Rob Hall in 1996, but he never came back. 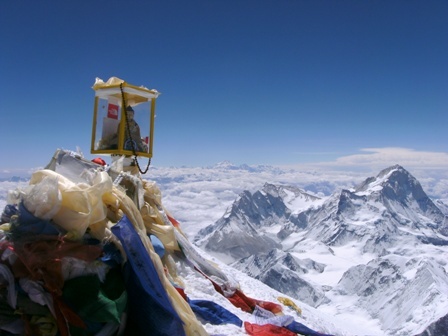 This is the site of the famous shot of Jamling Norgay on the cover of the IMAX movie ‘Everest’. But for us it was still the middle of the night. No views, not even a sense of how much higher the South Summit was. So we changed oxygen bottles quickly and continued up the South East ridge proper for the first time. As I walked up, I had one foot in Nepal and the other in Tibet. After curving up to the right at a gentle gradient, the slope then steepened considerably. It was still pitch black – there was very little natural light and almost no moon. All I could see was what crossed the beam of my headlight. In front of me the three figures moved slowly upwards. Nuru was behind, perhaps 50 meters behind for most of the way. The Sherpa in front of me stopped and took off his red mittens, and one of them promptly fell out of his hand and down the snow slope into Nepal. He looked aghast and soon the glove spun over the sheer 5,000 foot drop of the Southwest Face. Seeming a mixture of sheepish and slightly panicked, he carefully put his hand into his down suit pocket to keep it warm, knowing that even though he still had his under-groves, he risked almost certain frostbite if he didn’t do something. For a man who makes his living at altitude this was a big problem and a terrifying moment, but he kept climbing. The next time I saw him, his hand had a borrowed glove on it – I still don’t know who he got the spare from. Suddenly we were on rock again – very steep rock – and the sun began to light up the sky. I was now climbing more exposed and tricky rock that again was laid bare by the dry season – left foot on an inch deep ledge, right foot in a thin veneer of ice covering the rock, left again at waist height in a rock crack. 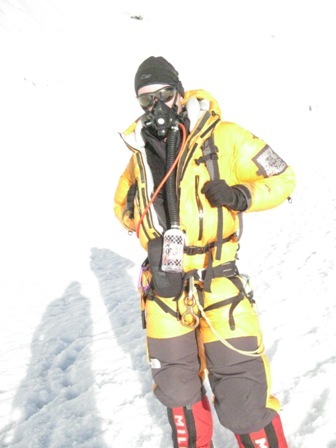 This was much more difficult than I expected, and the bulky clothing, oxygen mask and huge boots made the task all the harder – particularly given we were now at around 8,650 meters – higher than any other mountain in the world, higher than the summit of K2. Soon the rocks were behind us and the slope remained steep, leading straight up to what seemed to be the highest point, but which we knew to be the South Summit. Then I felt a strange feeling which at first befuddled me. My crotch was cold. Of all places this is the last that should feel cold – all mountaineers know that. I looked down and to my horror my zip was still undone. After going to the loo on the South Col and being called out of my tent I had forgotten to zip up!. Frantically I tried to close it but it was frozen in place. I took off my outer-mitts and continued to wrestle with it. Eventually Nuru caught up with me and began helping, his Discovery helmet-cam staring straight at the problem. Great. Me wrestling with my fly on film for posterity… and I’d signed away the rights. You had to see the funny side. Eventually the zip came unstuck and the cold rapidly went away. Dawn was now breaking and the sheer drop beneath my crampons was revealed – I was glad I could not see what was beneath me when I climbed the difficult section as it dropped away steeply. To my right the sun rose across a sea of clouds over Tibet, to my left the perfect shadow of Everest was cast over Nepal. I took out my camera which miraculously was not frozen and took a few photos. 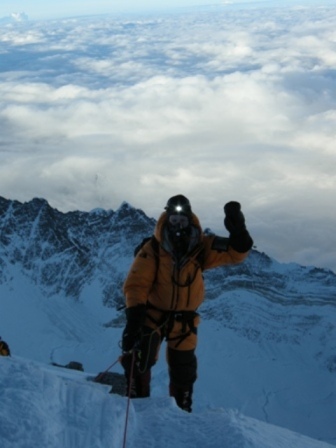 I was now in a good rhythm and at 5.30am I crested the final rise to Everest’s famous false summit. 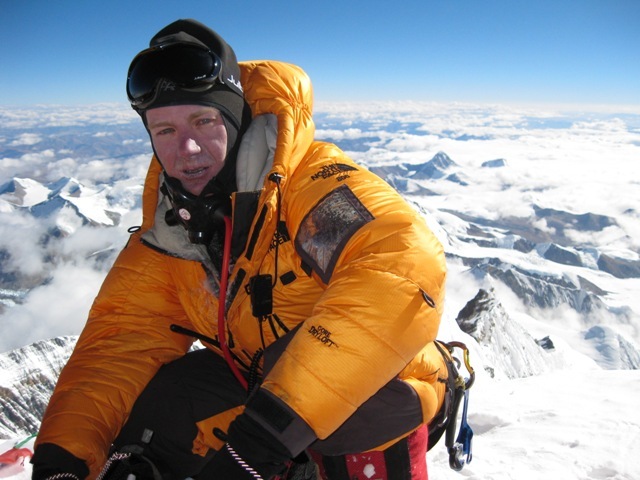 I was now at 8,750 meters and before me lay the final push – the summit of Everest. The same view as confronted Bourdillon and Evans on 26 May 1953 when they became the first men to see it. They could have been the first to scale Everest had it not been for a faulty oxygen set, three days before Hillary and Tenzing. I felt lucky I had not had the same problem. We dropped over the South Summit into the niche below the rock that forms it. It was here that Rob Hall was trapped in 1996, and it was from here that he was patched through for the tragic last call with his pregnant wife back in New Zealand after Doug Hansen and Andy Harris had died. His body is gone now, likely let loose down one of the faces so that it did not become a permanent feature, like ‘Green Boots’ is on the North side. We changed oxygen bottles again, but as on the Balcony, mine was still half full. We continued along the knife edge ridge, walking along overhanging cornices, one foot in Nepal, one in Tibet, breathe and repeat. The exposure was greatest here. 8,000 feet on down the Kangshing Face into Tibet on the right, and 5,000 feet into Nepal down the Southwest Face on the left – sheer on both sides. Good footwork was important here. While I was clipped in to the rope, I wouldn’t have wanted to test it with a long fall, as there was a high likelihood that the anchors may not hold. As I traversed the corniced ridge, two climbers coming down stopped in their tracks on the ridge, a vacant look in their eyes. When there is a single rope it is usual for those going up to lean into the slope and let those coming down clip round them. Instead they just stared at me. I leaned in, motioning them to clip round me. Nothing. So eventually I unclipped and raised my carabiner, waving it as I passed. No response. They were wasted by the altitude. Once past I clipped back in. 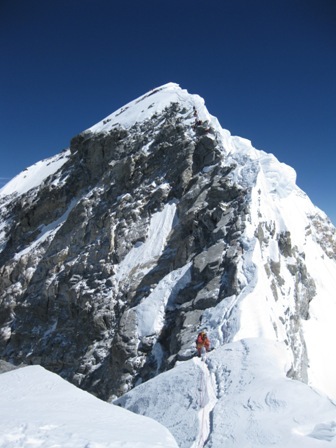 Within 20 minutes we came to a stop at the famous Hillary Step – it was blocked with climbers descending. The step is a sheer 40 foot cliff cut straight into the ridge – there is no way round it. Hillary famously edged his way between the ice and rock during the first ascent in 1953, and it is a common place for intimidated climbers to turn back. We waited. Eventually the step cleared and the three of us headed up. All of us climbed it quickly and without great effort, and soon we skirted the final rock and came out on top of the step. Before us lay the relatively gentle final slope to the summit, perhaps only 30 minutes away. This was it, nothing more in the way now. I continued up and again felt strong. My excitement must have been dulled by the altitude, I just felt good about approaching the summit. Suddenly there were no images of the past, no exhaustion, no sense of relief, no drama. Just me, walking up to the top of the world, happy with the day and feeling strong. As I neared the top my pace increased to a march, and taking my only twenty steps in a row of the day I stepped onto the summit of Everest. I had lost all track of time, but was later to find out that it was 7.14am local time, 1.29am GMT. Finally I was there – the place I had dreamed about since I was six, read countless accounts, seen hundreds of photos. Yet all those memories were absent. This was my summit day and all other stories, all the history, was gone. 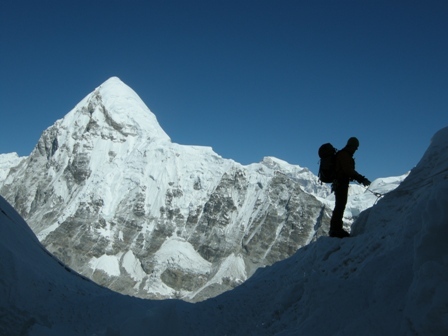 Everything dropped away on all sides, the North ridge into Tibet, the West Ridge into Nepal. It was a truly perfect day. I could see for hundreds of miles. There was a perfectly flat layer of cloud at about 6,500 meters, which meant the valleys were under cloud and only the highest peaks pierced through them. 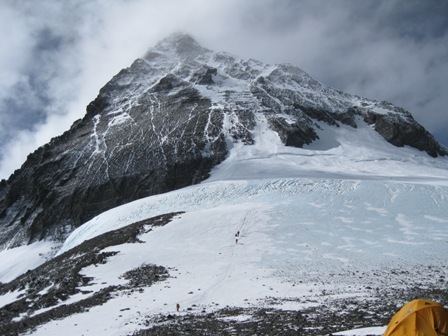 Pumori, at well over 7,000 meters dominant at Base Camp, was a small cone just peeking through. Cho Oyu, one of the world’s giants at 8,201 meters, looked like a minnow. 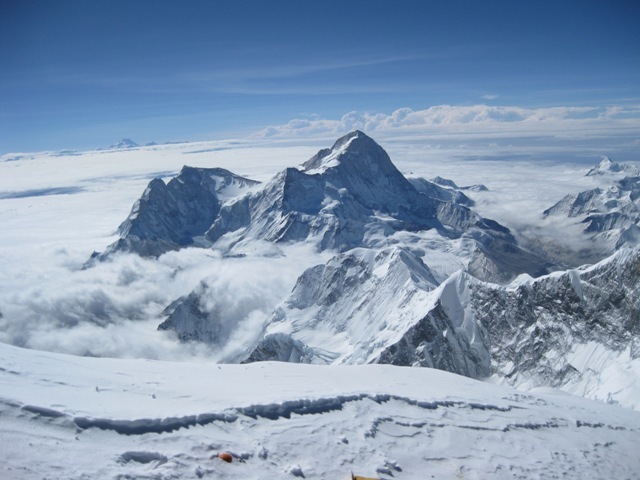 I remembered how big Everest had looked as I looked across in 2004 from that summit. I was so high everything was dwarfed. Looking at the horizon, you could clearly see the curvature of the earth – much more clearly than I had seen it in 2004. It was beautiful, celestial. The summit was the size of a pool table, and once on top, almost as flat. I settled on the highest point, the top of the cornice to the right where the views over to Makalu were best. No one else trod there as it was overhanging, but it was the true highest point and I had it all to myself. I took off my oxygen mask and breathed the cool air at 8,850 meters – where the toposphere meets the stratosphere. I would keep the mask off while on the summit. 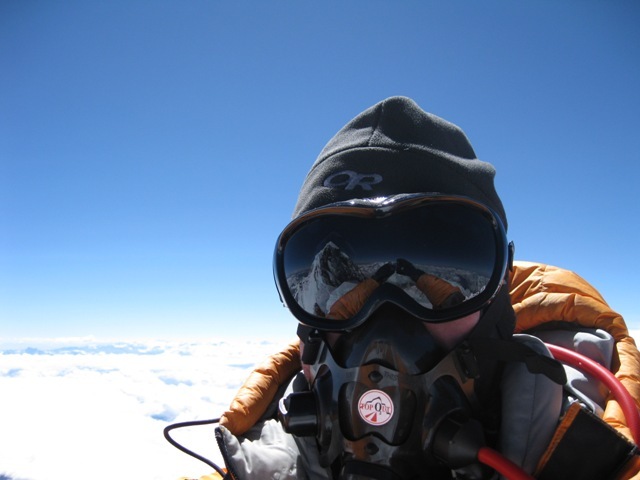 Once I had taken in the view I got down to practical matters – radioing down and taking summit pictures. I called Russell on the radio and if I remember correctly gave him a pretty perfunctory message from the top – no ‘small step for man’ speeches for me. Then I think I had a rather more rambling message for Alix, which I can’t remember – I certainly hadn’t prepared anything and I’m not sure it will go down in history for its lyrical poignancy. Soon after, John Black, who I had passed at the Hilary Step, arrived and we agreed to take each other’s summit shots. Being sponsored by more companies than seems possible – he was a veritable walking advertisement board with all the logos – John dutifully retrieved flag after flag from his pack and I clicked away. I must have taken 40 shots of him with all this junk, so when it was my turn I said ‘You owe me’, and proceeded to do a number of summit poses, with John patiently snapping away on my camera. After a while Russell radioed again asking me to get down and I replied that I was enjoying myself on the summit, felt very strong and would leave when I was ready. He said, ‘Look I have to say that for the cameras’ which I thought amusing. He doesn’t say anything for the cameras – he just wanted everyone to get down the mountain, but realised he wasn’t in a position to move me. Eventually after another gently nagging call, I stepped off the summit. I had been there almost an hour and loved every minute of it. An hour without supplemental oxygen at the top of the world and I felt great. I didn’t want to leave it was so beautiful, but once I stepped off the top that was it – I was on the descent and didn’t look back. I radioed Russell that I was leaving, and just got back ‘Copy that’. I hadn’t been lying to Russell – I felt great on the summit ridge. I can genuinely say that I have never enjoyed climbing more than those few hours on the highest ridge in the world. I was soon at the top of the Hillary Step and dropped into an abseil down the famous landmark. I then began to traverse the very narrow section of the corniced ridge when I found a man sitting on the ropes in front of me, completely blocking my way. I asked him to move, but he was unresponsive. I tapped him on the shoulder, but he turned round and waved me away in Russian. I was getting pretty pissed off now as he was sitting on the rope I was clipped into, so I couldn’t even go round, and in any case there was about 15cm of snow between him and the 5,000 foot drop-off into Nepal. He was looking away from me so I just stood there. I just thought he was being obtuse by resting in such a precarious position and flicked my dangling glove over his head. He turned again, babbling away angrily at me. So I unclipped on the most dangerous part of the route and climbed past, cursing the man’s manners. I would later find out that he – Boris – was both a guide and in deep trouble, with HACE or cerebral edema and blurred vision. It just didn’t occur to me that someone so pointedly rude could be in trouble. You don’t think straight at 8,800 meters, but stubbornness is actually a sign of cerebral edema which I should have spotted. Later he would fall in front of one of our guides Shaun, who diagnosed him, injected him straight through the down-suit with Dex (Dexamethasone, a powerful steroid that can help stricken climbers with HACE), and helped him down to Camp 4 – another Himex rescue. Soon after Boris I reached the South Summit and waited for Nuru. He was about 5 minutes behind so I lay back on my pack to enjoy the view. In fact I was so relaxed I lay flat, with my hands behind my head and one of my legs crossed over the other. Soon Nuru arrived and I asked him to take a picture of me, which he did. Suddenly Russell’s voice cracked over the radio – ‘What the hell are you doing?’ – of course he could see me through the helmet-cam as what Nuru could see, Russell could see. I replied that I was ‘sunbathing’ while waiting for Nuru and I could hear a grumble down the other end. Anyway I picked myself up and continued my descent. Only later when I saw the picture did I realise how incongruous this must have looked at 8,750 meters, but I was just enjoying myself. Another hour of steep descent and a couple of long abseils over the steep rock we had climbed earlier and we were at the Balcony. After a short rest and the last of my water, I headed down the gully towards the South Col, moving fast. Some way above the Col I noticed something blue to my left and turned. It was a dead body lying in the snow about 15 feet away. I didn’t move from the rope, which I was just arm-wrapping, but stared in quiet contemplation. Who was it? I couldn’t be sure. It was the first and last body I would see on Everest, yet there are over 200 scattered over the mountain. I thought it might be Scott Fisher, the guide whose death was recounted in ‘Into Thin Air’ – he was wearing a blue down-suit and died just below the Balcony – perhaps he had been avalanched lower down? It was a stark reminder that despite how good I felt right then, others much stronger than me had battled for their lives in the same place at different times. It was sobering. I descended rapidly back to the tents on the col, reaching them 40 minutes after leaving the Balcony. It was 11.30am and I was back in under 12 hours, including all the faffing around! 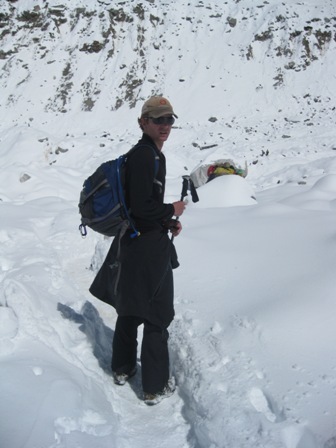 As I arrived Phurba passed me some Sherpa tea and I drank, thankful that I didn’t have to melt my own snow. I didn’t feel that tired, but the Col was still sunny and seemed like home – yet I had a powerful sense of wanting to get out of there, to go lower. It was still almost 8,000 meters – well into the ‘Death Zone’ – and it was an illusion to think it was a safe place. I rested for a while and then made the decision to descend, although I didn’t break camp until 2.30pm. Despite feeling slightly tired now, I was now committed to a night at Camp 2, all the way down at 6,400 meters. Almost everyone who climbs Everest from the South Side overnights at the South Col on the way down, and very few non-Sherpa make it down to Camp 2, but I was determined. Staying at Camp 3 was not an option as all our tents were full with members of Team 2 on their way up for their own summit bid. Soon after I dropped in an abseil over the top of the Geneva Spur and began the long traverse back to the Yellow Band I realised that this was going to be a lot harder than I had thought. Leaving the Col meant leaving the cool breeze, and dropping over the lip of the Lhotse Face brought me into a cauldron of heat in the middle of the afternoon. I was still wearing all my summit gear, although now all unzipped almost to my waist. I was SO hot it was unbearable. I had brought one and a half liters of water, but as I gulped it down to quench my never-ending thirst I realised it would not be enough. Down and down I went, getting more and more exhausted. Once again I had a heavy pack on, with all the gear I had left at the Col, as well as oxygen. Each time I bent down to unclip and re-clip the rope, my neck got a little more sore. A few times I sat down in the snow just to rest it. By Camp 3 I was in agony, and just lay on my pack to get some relief for what was now serious pain in my upper back and neck. After getting some fresh drinks I headed down. Guide Adrian had now caught me up, and urged me on despite my pain. Another long arm-wrap, endless descent down a steep wall. No mistakes now – this is where people get themselves killed – when they are exhausted on the descent and make a mistake. I sat in the snow again – the pain in my neck was now unbearable and I told Adrian I needed to rest. ‘No’ he replied, ‘let’s just push on. It’s not that I don’t care about how much pain you’re in, but it’s irrelevant, we have to go down’. He was right of course, it was late afternoon and I could not afford to hang around on the Lhotse Face. I was just so dehydrated, so thirsty. 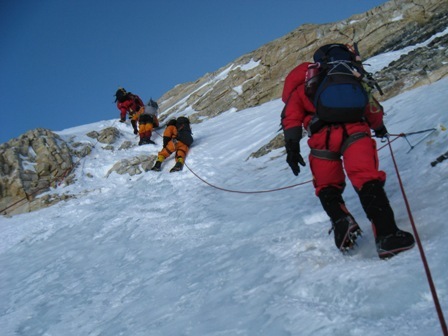 Eventually we reached the bottom and began the hour-long traverse back to Camp 2. I finally dumped my pack outside the mess tent – what a relief – and went inside. It was 6.30pm and the sun’s rays had faded. I couldn’t eat – just drank endless mugs of hot lemon. Soon after I stopped moving my neck seized up completely – I couldn’t even move an inch in any direction. It was agony. Adrian gave me a pack of Ibuprofen for the pain and I went to bed. I was exhausted and wet through from the sweat of climbing down the Lhotse Face in the searing heat while wearing my downsuit, but now it was too late for the sun to dry me off and the moisture began to freeze on my skin. I crawled into my tent and meant to put my Thermarest underneath me – which would have kept me warm and more comfortable – but I only got it half out of my rucksack. I fell asleep fully dressed in my damp clothes where I lay, half covered in a sleeping bag but not in it – the end of one of the longest days in my life. The next morning I woke at around 7am, but still could not move my neck, much less get up and start the trip down to Base Camp. I took some more Ibuprofen. I was still wiped out and lay in exactly the same position I had slept in, my head resting on my boot and my Thermarest still to one side. I was still in my downsuit, and still wet through. I didn’t have the energy to get up, so just lay there waiting for the sun. Eventually as the sun rose and heated the tent, I began to dry off with its heat. Still I lay there, too tired to move around. Eventually at around 11am I was warm, and dry enough, to raise myself – by now the pain had subsided. Slowly I began to undress and eventually I stripped down to my base thermal layer only. Once it was dry, I started the slow process of getting my things in order. It was to be a very long, slow day of intermittent packing. I made it to the mess tent in time for lunch and soon after the first of the rest of my team arrived in Camp, having left the South Col at 4am that morning. By 2pm they were all in camp. In the end everyone was too tired to go down, so there was no-one I could hook up with to descend through the Icefall. It was frustrating but there was little I could do – they were tired and I could not go alone. I resigned myself to another night at Camp 2, even though I was strong enough – and very much wanted to go down. I went to bed early, ready for our 4am start. We left Camp 2 for the last time at 5am, laden with very heavy packs stuffed with all the gear I had not given away to the Sherpas at Camp 2. By 6am we had negotiated the Cwm and were in the Icefall. We were all so tired. Bend down and clip in, cross ladder, bend down and unclip, arm wrap down – all almost on autopilot – I just wanted to get it over with, but of course this was no time for complacency – the Icefall is in fact never more dangerous than late in the season when the temperatures rise as summer approaches. As we began the descent into the Icefall I switched on my radio. The 2nd summit team was on their way up today. I could hear the odd voice over the airwaves indicating where some of them were. Most were silent – pressing on in their own private nightmare. Only later were we to find out what a difficult day this had been for them. Suddenly there was an SOS call – not from one of our team, but again from another stranded climber. 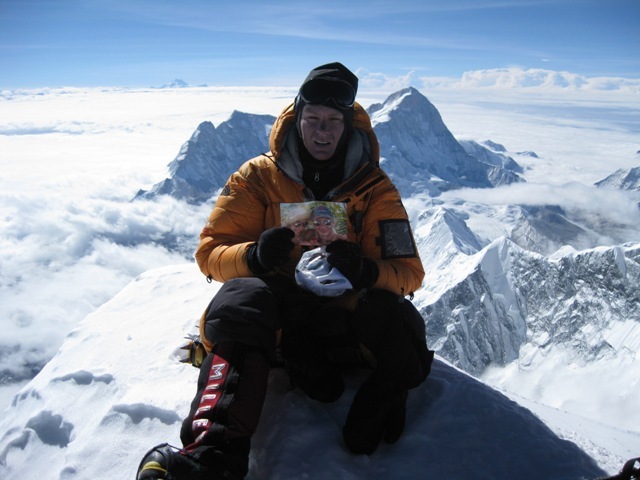 We all knew the name – it was Mike Farris, he was stuck at the Balcony and had spent the night out at 8,450 meters. He was in deep trouble, was unable to move, and was badly frostbitten. One of our climbers reached him and then called Russell for help. He was infamous for all the wrong reasons. He claimed to be attempting a ‘solo’ ascent of Everest, yet was using all the fixed ropes on the main Southern route. He was also known for having written a book about ‘How to survive at high altitude’ before having gone to high altitude – and he wasn’t even a doctor. Lastly, he had been deeply critical of commercial expeditions such as ours. 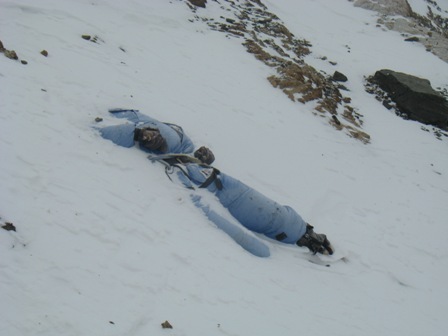 Now with heavy irony, he was in deep trouble at altitude (he would later lose all fingers, toes and his nose to frostbite), using our ropes (so not climbing solo), and was asking to be rescued by a ‘commercial’ expedition (ours). Phurba, who was still on the South Col, organized a rescue with Russell, and soon he was brought down by our Sherpas to the South Col. All of this drama up high was piped straight into my radio mike on my lapel as I down-climbed the Icefall, interspersed with news of various members of Team 2’s early summit success. It was all still happening up there, but I was almost off the mountain. Living it vicariously was a strange feeling and I imagined what it must have been like for Alix sitting at Base Camp hearing the same thing the night I left the Col.
As usual the Icefall seemed to go on forever, but finally by 9am we reached the flat section of glacier that marks the end of the Icefall proper – just another half an hour to go before crampon point and another 20 minutes until our Base Camp. I had wanted to radio Alix to let her know where I was so she could come and meet me at the Icefall’s edge as agreed, but given the rescue was in progress I obviously didn’t use the frequency. I joked with guide Dean that it would be a shame she wasn’t there as I was SO thirsty. He said, ‘if she’s a good girlfriend she’ll be there’, and lo and behold as we finally made the last few steps into the main Base Camp Alix walked over the ice to hug me. I was safe. And she had brought a bottle of cold Fanta! What an angel. I turned to Dean and smiled. After a brief rest and an emotional reunion we headed off for EBC. As I crested the moraine hill I heard shouting and cheering and was greeted with a sight I will never forget. 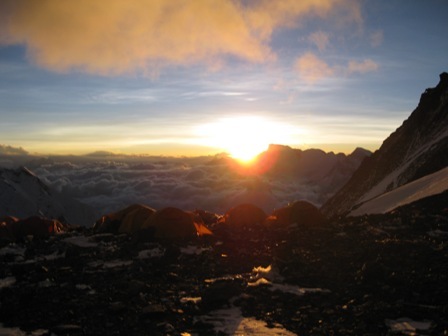 All the members of the expedition in camp, all the guides, all the Base Camp Sherpas – everyone was standing in front of the white pod shouting, clapping and banging pots, trays, anything metal and that made a loud noise – it was the traditional summiteers welcome. I was honored. I was home. I had done it. It was over. I’d like to thank Russell, the guides, and especially all the Sherpas for all their help – nothing would have been possible without them. And thank you to all of you for reading this and all your comments – they were so wonderful to read and I did so assiduously. Lastly, all my love and thanks to Alix for all her support and for remaining charming and cheerful through it all! For the last time then, over and out. I’m back. Apologies for the lack of post since last Sunday but this week has taken a hectic and unexpected turn. I was hoping calmly to write my summit push account in the sunshine at Base Camp as I promised in my last post, but on Monday morning it began to snow, and snow…and snow. And so just when the season was drawing to a close, we got hit by the biggest storm of the year, lasting two full days. As a result we had no solar power…and I couldn’t write my account. On Monday morning we woke up to a very snowy Base Camp, but we also got ready to welcome the members of Team 2 back from their summit push. 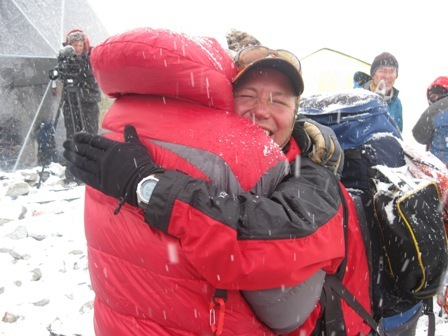 It was a very emotional scene as they came into camp, with every guide, Sherpa and member of Team 1 banging pans and cheering. 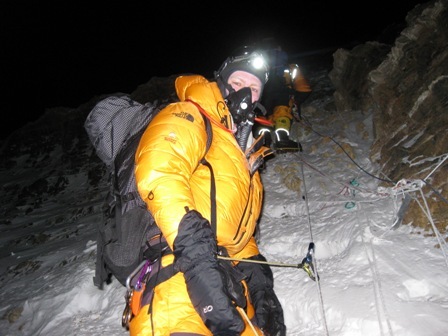 Team 2 had suffered from a much more difficult summit day – colder, windier, and no view from the summit. Many of them had been ill with a late strain of ‘Delhi belly’ and fought through difficult conditions to succeed. With Team 2 back in camp and all the Sherpas off the mountain we were all able to breathe a sigh of relief – everyone was back in camp, and no one was injured or frostbitten – quite an achievement. After the elation of Monday morning the storm hit hard. 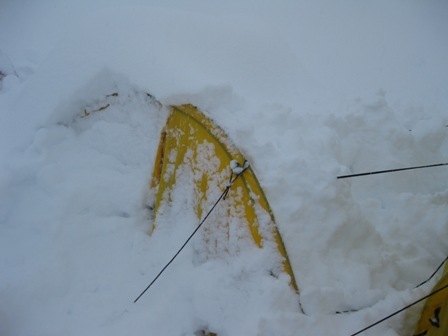 A meter of snow fell on Monday and on Tuesday morning Alix and I woke at 5am with the roof of our tent pressed against our noses – it had collapsed on us from the weight of another half meter of snow that had fallen overnight. Suddenly we heard voices – team-mates offering to dig us out. The noise of shovels scraping against the tent fabric began and eventually we were able to crawl out and help with the excavation of camp. It was an incredible scene – tents had literally disappeared under the snow and people were trapped. 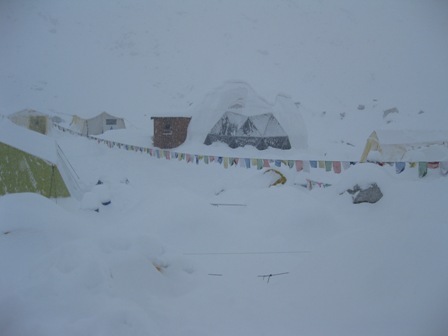 Eventually over 2 meters (6 feet) of snow would cover the camp. Russell called a meeting and announced that a) we would have to spend the morning helping with the ‘digging out’ of camp, but that the storm was due to abate later that day, and b) we would have a party starting at midday once the job was done. He then produced three full barrels of champagne and we got to work knowing that another of his famous end of expedition marathon white pod parties would be starting once we’d finished our work. Given the weather no-one expected that we would be leaving camp, as had been planned, any time soon. So everyone got WELL into the party mood. I dragged myself to bed at 3am, and was woken by Alix at 6am to be told that a) the weather had cleared up and b) as a result Russell had decided that we would take advantage of the break in the weather to leave Base Camp for the walk out. I was massively hung-over and under-slept (alcohol at altitude has a much stronger effect…). Reluctantly I began final packing of the barrels that would travel separately by porter and what would travel with us. With a pounding head this was a tricky operation but eventually we were ready, and after goodbyes to Russell, the Sherpas and the guides, Alix and I set off with the rest of the team down the valley. This was yesterday morning. 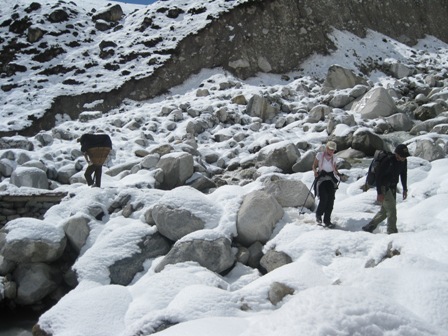 We trekked through deep snow initially, then through the slush as we dropped in altitude. Alix and I made it down to Pheriche at 4,200 meters and this morning we flew out by helicopter to Kathmandu. So now I write from a hot dusty city. I feel like a prisoner released from the clink after a long stretch inside. No more regimented meal times with a gong banged at 8am, 1pm, and 6.30pm. Choice of food, heat, bustle, cars. It is all a bit of a shock. I was at EBC just yesterday morning. It all feels very strange. So we are now beginning to relax. We are planning a big group dinner on Saturday night when the team re-groups in Kathmandu. Then there are the barrels which are making their way slowly down the Khumbu valley by yak before they are loaded on backed-up flights. It could be a while. But at least it will give me some time to reflect on the whole summit experience and post as I promised – the last week has just been too much of a blur. I will post my summit push post with all the photos within the next few days now that I have electricity and time! So over and out from…..Kathmandu. Guide Hiro gets into the party mood - Domodomo!